CWB UK went to a tour to refugee children and their families in the camps and asylum centres across Serbia. 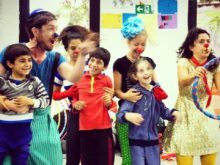 In October 2014, Clowns Without Borders Spain went to Serbia to perform for children and young people with development issues, and to help out social workers in Pancevo . They met 465 people in total. 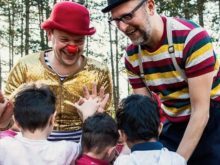 In 2010, Clowns Without Borders Spain went to Serbia to offer performances in nursing homes, orphanages and schools for people at risk of exclusion. They performed 5 shows for 490 people. 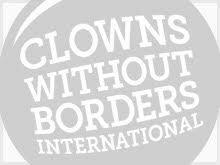 In 2008, Clowns Without Borders Spain went to Serbia and performed 11 shows for 4200 people. 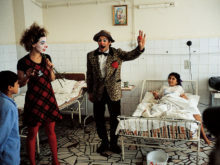 In 2006, Clowns Without Borders Spain returned to Serbia with some clowns from Italy and got the support of the association “Un bambino per Amico”. They performed 7 shows for 2000 people. In 2002, Clowns Without Borders Spain returned to Serbia and performed 7 shows for 2000 children. In July 1998, Clowns Without Borders Spain continued its action among war refugees in Banja Luka, Serbia. In March 1997, Clowns Without Borders Spain continued its action among war refugees in Banja Luka, Serbia.